Researchers in Cambridge and Exeter have discovered that jackdaws use their eyes to communicate with each other – the first time this has been shown in non-primates. While what humans do with their eyes has been well studied, we know almost nothing about whether birds communicate with members of the same species with their eyes. The new study, published today in Biology Letters, shows that jackdaw eyes are used as a warning signal to successfully deter competitors from coming near their nest boxes. Gabrielle Davidson of the University of Cambridge, who led the study, said: "Jackdaw eyes are very unusual. Unlike their close relatives, the rooks and crows – which have very dark eyed – jackdaw eyes are almost white and their striking pale irises are very conspicuous against their dark feathers." While most birds have black or dark brown eyes, bright eyes are not unknown in the avian world, and around 10% of passerines (perching birds) have coloured irises. The question Davidson wanted to answer was do jackdaws use their bright eyes to communicate with fellow jackdaws? Just before the spring breeding season arrived last year, Davidson installed one of four different pictures in 100 jackdaw nest boxes on the outskirts of Cambridge. The pictures were either black (the control), a pair of jackdaw eyes, a pair of jackdaw eyes in a jackdaw's face, or a jackdaw's face with a pair of black rook eyes. She then filmed the effect the different pictures had on the birds' behaviour. "Jackdaws are unique among the crow family in that they nest in cavities in trees. These hollows are natural – the birds cannot excavate their own nest cavities as some woodpeckers do – so they have to compete for a limited resource. And because jackdaws nest in close proximity to each other, they fight a lot to gain the best nesting sites," she explained. Often what initiates these fights are jackdaws approaching nest boxes that are not their own. After analysing 40 videos of jackdaws peeking into each other's nest boxes, she found that compared with the other nest boxes, those that contained the picture of a jackdaw with its bright eyes was much more likely to deter the birds from landing on it, and that the birds spent less time near such a nest box. Davidson's study is the first to show the eyes being used as a means of communication between members of the same species outside primates. "Before now we knew very little about why some birds have brightly coloured eyes. In jackdaws, the pale eyes may function to improve their ability to defend their nest and chicks from competitors. 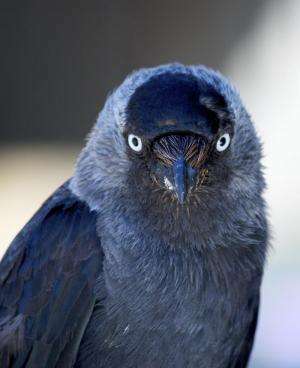 It also raises the question of whether this is unique to jackdaws, or if other cavity nesting birds also use their eyes in a similar way," she added. As an old time parrot breeder I can tell you that double yellow head Amazon parrots will "flash their eyes" (rapidly constricting and dilating their Orange irises when expressing anger or other emotions). Blue and gold macaws do the same thing but their irises are less visible.